A caged tiger who is regularly fed is probably not too keen to escape the quadrangle. Look at him — he’s mostly in the midst of a lazy yawn. A child who has never seen a tiger would find it hard to discover his ferocity behind the metal nets, and might instead be moved by his deep eyes, incisive canines and checkered fur. “Here is my new pet!” he might exclaim. Aryanil Mukherjee’s “Woodense” is not a poem that takes such a juvenile jab at the tiger (one might be erroneously lured to think of Rainer Maria Rilke’s “Panther”). 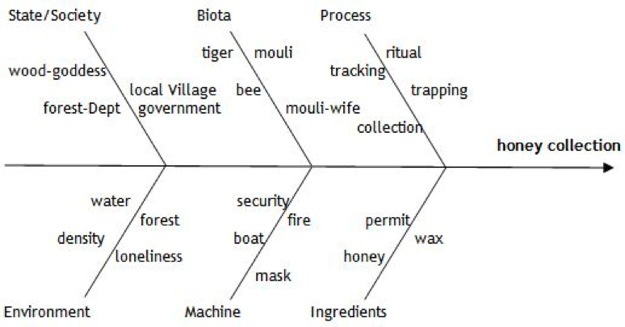 Rather, it is more about the “woods,” and about the “mouli,” or the “wives”; it is about the “bees,” the “honey,” and the “forest-department.” A whole network of closely connected themes. The “wood” seems to read as an extended metaphor at times, and at other times not. The specificity of transaction traditionally associated with metaphor is mostly missing from the “wood” and all its related concepts. The poem is based on a newspaper feature (Appendix I) on the problems confronting a marginal community of honey collectors in the Sundarban area of West Bengal, India. During a discussion Mukherjee disclosed that he had graphed a thought-schema as a pre-text, much like a scenario, to use the language of films. The thought-schema, borrowing from graph theory, is an “object-oriented” diagram in the sense that the key themes mentioned in the report are objectified. Each “object” is represented by certain well-defined characteristics (usually descriptors), has a figuration in the theme hierarchy, and is interrelated with other objects. 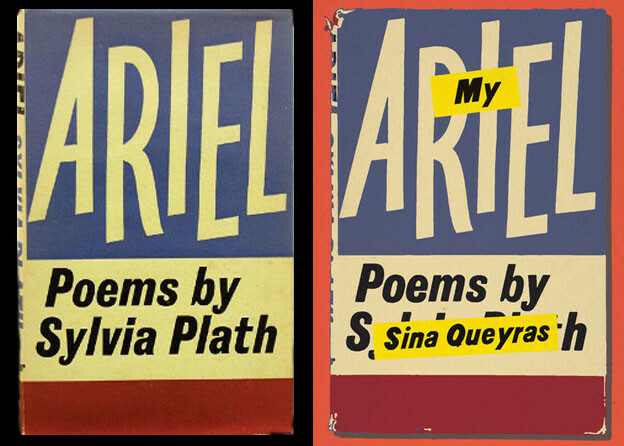 The poem seems to intertwine two texts, a regular poetic text and a part-poetic-part-informative text, so as to guide the reader through the poem’s desired flow of logic. 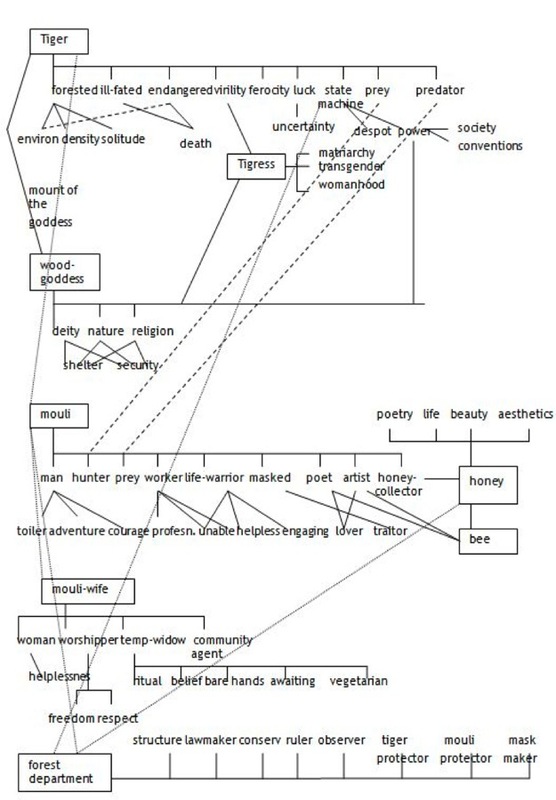 The thought-schema, in a nutshell, suggests structure that arranges the poem’s thoughts. It also tempts the reader to consider the objects in the poem as metaphors. Parallel to the traditional metaphor there could be another kind that is indefinitely indiscrete, one that is not used to convey meanings or feelings. A whole commune of metaphors or “A-phors,” as we choose to call them, each with its clouded orbits uniting to initiate a collective thought-stream. The poem, as a result, dissipates ideas rather than controlling them. Because this A-phor-assembly is huskless and granular it seems to fit a wide range of thought-patterns. The thought-schema of “Woodense” as sketched by the poet. It might be possible to compare the concept of Six-Sigma to the thought-schema of the poem. Six-Sigma is a technological philosophy, a vision; initiative- and goal-oriented, it can also be seen as a tool. In a nutshell, Six-Sigma can be used as a means to stretch out the thinking process. Essentially a business and technological production management strategy, the term “Six-Sigma” is borrowed from the statistical representation of certain phenomena in process capability study. It is defined by a 5-step process — Define, Measure, Analyze, Design, Verify — expressed as a pentagon with the desired product (in our case, the poem “Woodense”) at the center. Step I: What would be the first step of the process — “Define”? We feel it would probably be the newspaper feature from which the poem’s thought content originates. Step II: In the “Measure” step, the poet selects certain facts from the report and/or other related sources, conceives and germinates ideas, develops an understanding of the relationship model that connects the “subjects” (expressed as “objects”) of the story. Step III: For the poet, the “Analyze” phase is perhaps most important. The acquired data is digested in this step, which helped Mukherjee construct his thought-schema. This object-oriented relational model helped him discover a complex nexus of interrelations and dependencies that are not in the newspaper report and are apparently unseen. 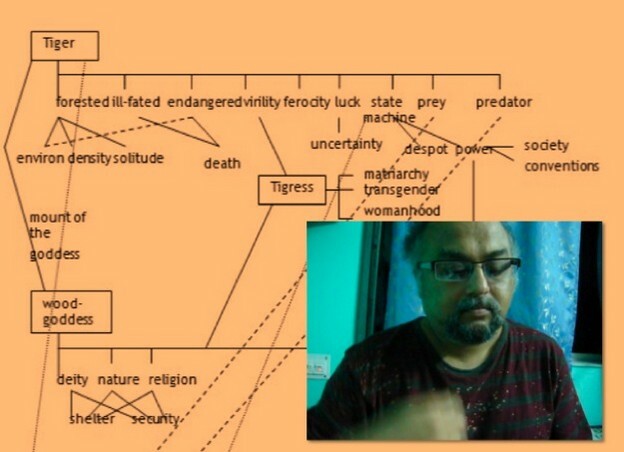 For example, he discovers the hidden connections between the tiger as state-machine and the worshipped wood-goddess Banbibi; how the poor, struggling mouli and his family become the proletariat, secretly opposed to the powerful (yet endangered) tiger and its protector, the forest department. Each singular feeling, every sensuous drive of every human adds up to mimic a forest’s density. Each individual is trying to live his own life according to a personal strategy. No one is ready to yield a bit. This leads to a social balance where every member is self-centered, making another kind of forest. Step IV: The “Design” step is mostly about presentation; it involves the actual writing of the poem. In the case of a technological production procedure, the design and manufacturing phases are the most laborious, painstaking and practical. For a writer, this step might include the selection and structuring of language and the writing of the poem (the presentation). It is possible that for “Woodense” this step involved a forked activity where two texts were written separately and then plaited into one. Step V: Art is usually not made to “Verify” anything, thus this last step might mean something very different for the writer. This could be seen as a reconsideration phase, where the writer either abandons his freshly composed work to gel or rot for a while and then re-examines it, or discusses it with fellow writers and friends before finalizing the work. This step marks the time when some of us would go back to Step I to revise the entire poem and the process that led to its creation. A fish-bone diagram represents the theme-data. A fish-bone diagram helps in analyzing collected data. It should not be seen anything more than a tool for constructing thought structures and relating themes, ideas and concepts; by no means can it substitute or enhance poetic ability or imagination. Now, in this wood, the tiger arrives. With its structure of social power, of political preference and economic disequilibrium, “a quarter on the left pan / a nickel on the right,” the poem seems to simulate the phenomenon of modern money mechanics via the complex tale of a rural society from the coastal forests of southern Bengal. Traditional narrative is avoided; instead, a mixed-media prose language derived from news, cut-up and embroidered with poetry, is interspersed among the poetic stanzas. In the end, it does become a poem of the self-devouring tiger — the common man of everywhere. With the official start of the honey collection season last Monday, the mouli-wives have begun offering prayers to Banbibi, the wood-goddess. Temporary widowhood is being practiced in more than a thousand families. Until the husbands return, the wives and their families turn vegetarian. They refrain from using soap, oil, and vermillion; they take off their wedding bangles; and they stay barefoot and milk-clad, wearing white saris only. Translated from Bengali by the authors.